Most parents today are well informed when it comes to stopping adverse habits that effects tooth and jaw development in infants and toddlers. Prolonged thumb sucking, pacifiers, and use of bottles past the age of three are reported to cause problems with teeth and impact early jaw development. However, did you know that poor bites and abnormal jaw growth is mostly hereditary and not caused by habits? Even if you stop bad habits before the age of three or breast feed your child, it is likely they still may develop a malocclusion requiring orthodontic treatment. Today we live in a multi-ethnic society which contributes to the problem. Very few people have perfect tooth alignment as a result. When you combine the small jaw of one parent and the large teeth of another, or vice versa, your kids will most likely exhibit hereditary dental issues requiring braces to correct for functional reasons. 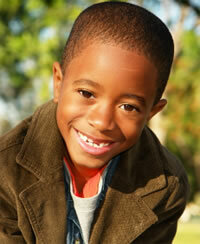 If one or both parents required orthodontic treatment themselves, than it only makes sense so will their children. Occlusion refers to how teeth line up and how they fit together in the upper and lower jaw (bite). All the upper teeth should fit slightly over the lower teeth and come together like gears to chew your food properly. The upper teeth keep us from biting our cheeks and lips and the lower teeth protect the tongue while we eat. When the teeth and/or jaws don’t fit together correctly, you have a malocclusion or poor bite. Malocclusions are most often hereditary, which means the condition is passed down through families. Why stop habits if they are going to need braces anyway? Parents who stop childhood habits early reduce adverse jaw growth issues caused by the non-hereditary self-induced problem. While it may not prevent the need for orthodontic care, it limits the extent of treatment required due to hereditary factors and in severe situations, can prevent orthodontic treatment combined with surgery as a young adult. What are the most common problems caused by bad habits? Narrowing of upper jaws that can develop into more severe crowding, crossbites, overjets or buck teeth, and impacted teeth that don’t have enough room to erupt properly into the mouth. Retruded or weak chin due to poor lower jaw development. Orthodontic problems are easier, quicker, and less expensive to treat when they are corrected early during the developmental years and much less invasive if adverse habits are eliminated by the age of 3. Treatment is most successful in children and adolescents when the jaw bones are still soft and teeth are moved more easily. The American Association of Orthodontics recommends that all children be evaluated by the age of 7 for orthodontic treatment. Adult orthodontics is very common today also, but may require longer use of braces or other devices since their jaws are already fully developed. Early detection and treatment may optimize the time and method of treatment needed. Contact Honig Orthodontics for a “Free Smile Exam” to determine the right time to treat your kids. As a dental specialist in the movement of teeth and jaws, orthodontist Dr. Gordon Honig will evaluate your child’s needs and discuss the best time to begin treatment for the most optimum treatment results.